Always a popular option at the annual NSCC event, the Topps wrapper redemption program brings the 2017 Bowman Chrome National Convention checklist to life. Featuring exclusive Refractors, there are also limited autographs to be uncovered in the incentive packs. 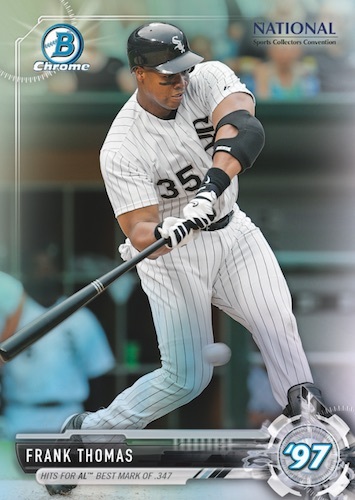 Taking the main 2017 Bowman design, the NSCC-exclusive set continues the ongoing celebration of Bowman's 70th anniversary. Distinguishing the cards from the other Chrome options, the 2017 Bowman Chrome National Sports Collectors Convention release adds a unique prism foil pattern and player-specific stat to the front of the card. These stats are taken from a season that sticks to decade marks coinciding with the anniversary. So, for instance, the Frank Thomas card highlights his batting average from 1997 while the Cody Bellinger card documents his 2017 MLB debut. 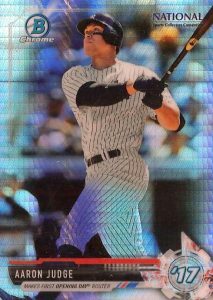 Other former greats in the 50-card base checklist include Derek Jeter and Sandy Koufax. 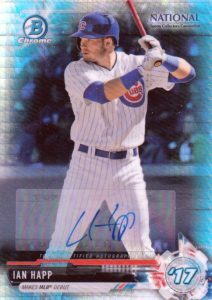 In typical chromium fashion, there are also several parallels to be found in the 2017 Bowman Chrome NSCC lineup, including Gold Refractor (#/50), Black Refractor (1/1), and even limited Autographs. 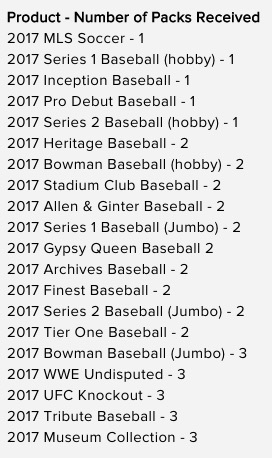 The 2017 Bowman Chrome National Sports Collectors Convention wrapper redemption packs are earned by opening specific hobby boxes at the Topps booth (in front of a Topps employee) at the 2017 National in Chicago. Basically all 2017 Topps Baseball products are included except Bunt, Opening Day and MLB Stickers. Hobby boxes of 2017 Topps MLS, 2017 Topps WWE Undisputed and 2017 Topps UFC Knockout also apply. PARALLEL CARDS: Gold Refractor #/50, Black Refractors 1/1. 28 cards. Serial numbered. Shop on eBay. Known print runs provided below. Not all players have both parallels.